The Ryukyu Islands ( 琉球列島 Ryukyu Retto ) are a chain of islands in the Western Pacific that stretches over 1000km long, the largest of which is Okinawa Island ( 沖縄島 Okinawa Jima ). Collectively, they form Japan's southern-most prefecture - Okinawa Prefecture ( 沖縄県 Okinawa Ken ). Okinawa also happens to be the poorest among the 47 Japanese prefectures. The capital is Naha City ( 那覇市 Naha Shi ), located on the southern part of Okinawa Island. The total population number about 1.4 million. Tourism and agriculture form an important part of its economy. Geographically, Okinawa Island is about 600km south of Kyushu Island and a similar distance from Taiwan and therefore mainland China. The Okinawa Islands have a long history dating back more than a thousand years to the ancient Kingdom of Ryukyu. Their proximity to both Japan and China meant that there was an abundance of influence from both cultures in all aspects of life - language, customs, architecture, food etc. They had maintained a tributary relationship with China since the 15th century and with Japan since the 17th century. The Japanese eventually annexed the Ryukyu Kingdom through military incursion in 1872 and it became a Japanese prefecture in 1879. During World War Two, the Japanese military converted the Okinawa Islands into formidable fortresses, deploying tens of thousands of soldiers in well prepared and well defended locations, supported by warships of the Imperial Japanese Navy and aircraft stationed at Naha, Kadena and Yomitan Aerodromes. As the Pacific War raged the United States adopted an island-hopping strategy, reclaiming one Japanese-held island after another, until they finally reached Okinawa. To the Japanese, Okinawa is the last line of defense for the home islands. To the US and her allies, Okinawa would be the staging area for the planned invasion of Kyushu in Oct 1945 ( Operation Downfall ) and the invasion of the Kanto Plain in the spring of 1946 ( Operation Coronet ), which of course never happened. The US Marines landed on Okinawa on 1st April 1945 and fierce fighting continued for 81 days before the island was secured. Out on the high seas, the invasion fleet had to fight off waves of kamikaze suicide airplanes launched from Kyushu and Formosa ( Taiwan ). It was also notable that the IJN Yamato, the biggest battleship in the world, was sunk by carrier aviation on her one-way suicide mission to Okinawa. In all, US casualties for the Okinawa Campaign amounted to 82000, out of which 12500 were KIA or MIA. The Japanese military casualties were even more horrendous, estimated at 110000 soldiers killed. Civilian casualties were estimated at between 30000 to 100000, out of a total population of 300000 then. And that marked the beginning of a seventy year long US military presence in Okinawa which is currently still ongoing and with no end in sight. The complete destruction of Hiroshima City and Nagasaki City by atomic bombs on 6th and 9th Aug 1945 finally forced the Japanese to an unconditioned surrender on 14th Aug, achieving what Air Force General Lemay's firebombing of Tokyo and other major Japanese cities failed to accomplish. It was followed by close to seven years of US occupation and administration under Supreme Commander Douglas MacArthur during which Japan was demilitarized and democratized. 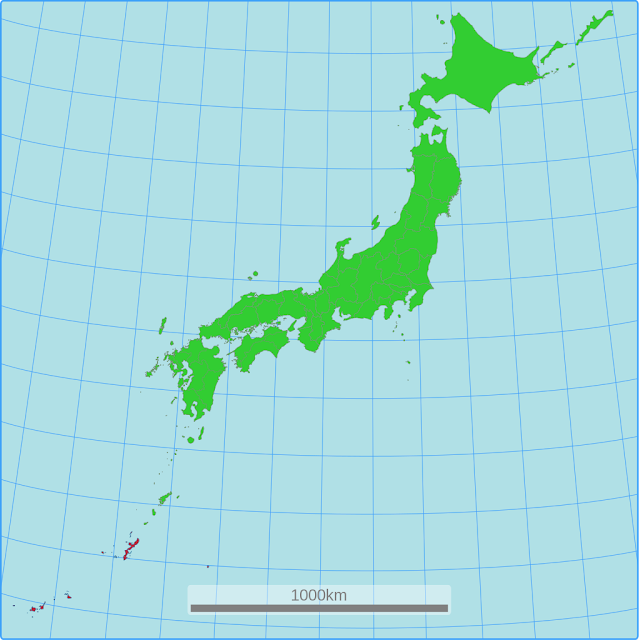 Japanese independence was restored in 1952 when the US occupation of the Japanese main islands ended under the San Francisco Treaty. However, Okinawa continued to be under US administration for another twenty years until 1972. Large areas of Okinawa Island were taken over by the US military for the construction of airbases, depots and barracks and for the creation of maneuvering grounds. Once acquired, the lands were off limits to civilians. About 20% of Okinawa Island is currently still under US control. 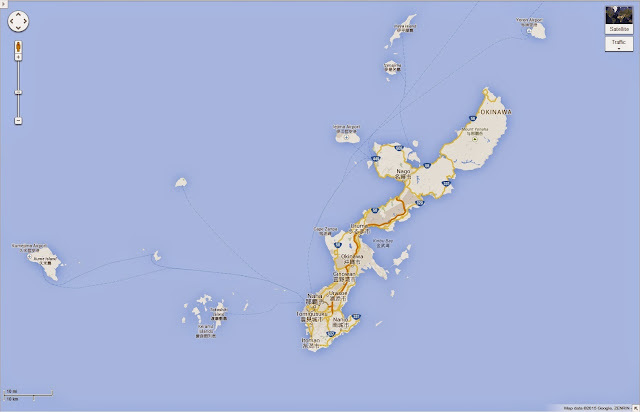 Map of Okinawa showing major cities and highways. 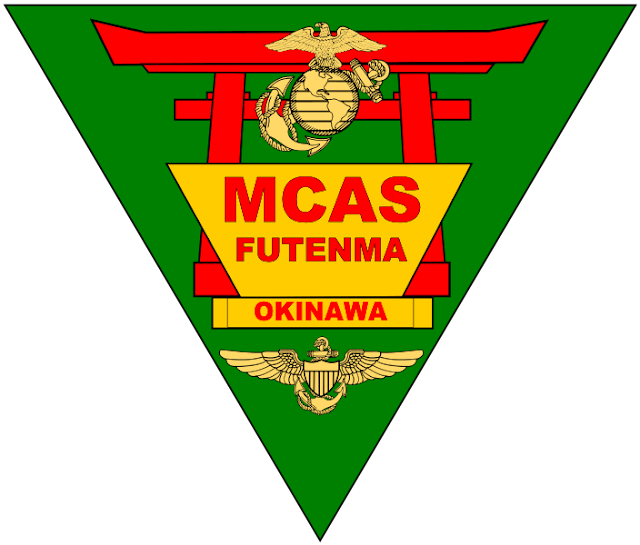 MCAS Futenma is at Ginowan City. Kadena AFB is at Okinawa City. 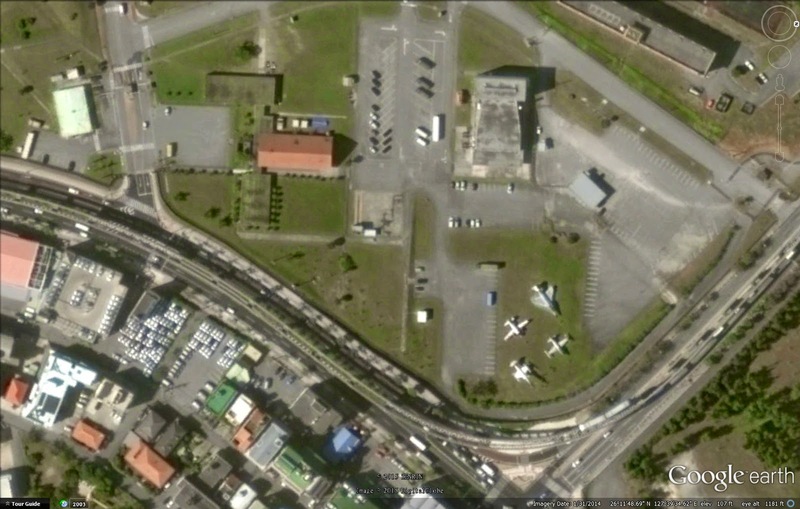 Henoko where the new Marines Air Station is to be relocated is south-west of Nago City whereas Motobu is west of Nago. Google Maps. 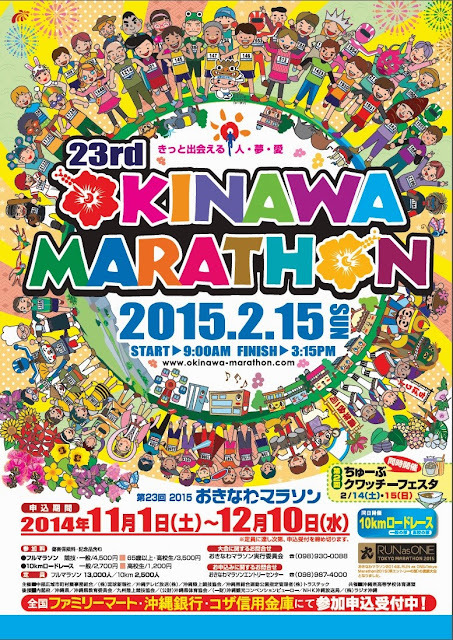 I happened to be in Okinawa for more than a week last month to participate in the 23rd 2015 Okinawa Marathon. It was my first visit to Okinawa and I did not know what to expect apart from what the brochures from JNTO described. They did not mention much about the presence of the US and Japanese military forces and their effects on every life in Okinawa. I had the entire trip to discover just how pervasive are the effects in every aspect of Okinawan society. 23rd 2015 Okinawa Marathon. The course brings runners around Okinawa City and at the 29km point enters Kadena Air Force Base Gate 2 and then exits the base at Gate 5 after 3km. 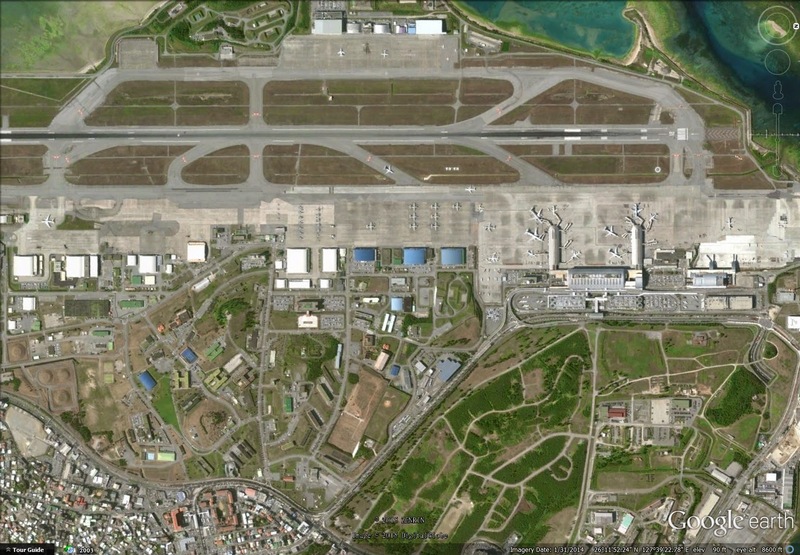 I shall begin by stating that Naha Airport ( 那覇空港 ) is actually a combined civilian airfield and a Japan Air Self Defense Force ( JASDF 航空自衛隊 Koku Jieitai ) air base. I was not aware of this when my Japan Airlines domestic flight from Tokyo was landing at Naha Airport as I was distracted by the emerald blue seawater to the west of the runway. Only now when I examine imagery from Google Earth did I come to realize that had I looked the other direction as the plane was landing, I would have likely seen an entire squadron of F-15J fighters on the tarmac waiting to scramble, together with T-4 advanced jet trainers, CH-47J Chinook heavy lift helicopters, E-2C Hawkeye airborne early warning aircraft and a swarm of P-3C Orion maritime patrol aircraft. JASDF Naha Airbase ( 那覇基地 Naha Kichi ) and Naha Airport side by side in this Google Earth Imagery dated 31st Jan 2015, less than 2 weeks before my visit to Okinawa. 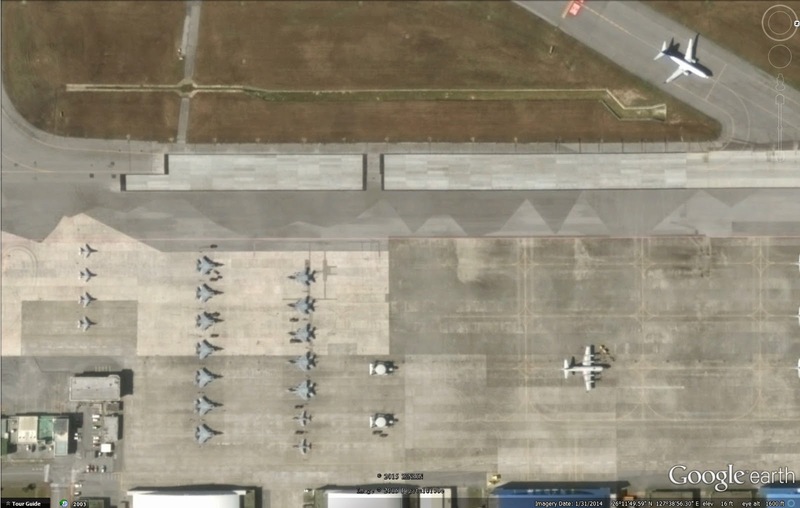 12 JASDF Mitsubishi F-15J/DJ and 6 smaller Kawasaki T-4 Advanced Jet Trainers of the 83rd Air Wing neatly parked in 3 rows. 2 Northrop Grumman E-2C airborne early warning aircraft with wings folded and a Lockheed P-3C maritime patrol aircraft are also seen in this enlarged view of the image above. A total of 8 JMSDF Lockheed P-3C Orion maritime patrol aircraft parked next to the domestic terminal of Naha Airport, the nearest P-3C is less than 300m from the civilian airliner. South ( to the left ) of the T-4s are 3 Boeing CH-47J Chinook helicopters and a smaller one, possibly a UH-60 Blackhawk. 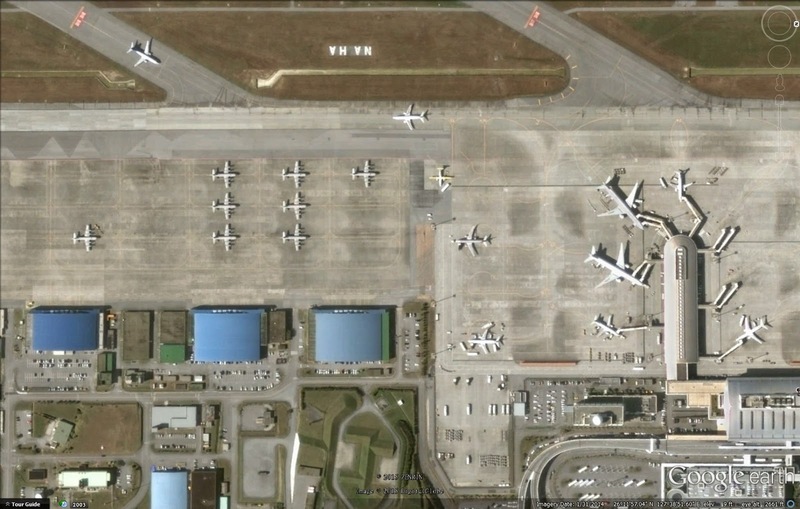 The large twin engine jet at the extreme left could be a KC-767 tanker. As Okinawa is only 410km from the Senkaku Islands who's sovereignty is in dispute with China and Taiwan, the F-15Js of the 83rd Wing JASDF stationed at Naha Airbase is on round the clock alert for intrusions by aircrafts from mainland China. In fact there had been 400 scrambles in the past year alone, up from less than a hundred 3 years ago, so much so that a second F-15J squadron had been scheduled to operate out of Naha this year. So the military presence can be quite visual even before one lands in Okinawa. As I left Naha Airport in a shuttle bus operated by my hotel, one of the very first landmark that I encountered as the bus drove towards Naha City was a quartet of legacy aircraft, previously operated by the JASDF, displayed prominently near the main gate of Naha Air Base. The most eye catching plane is a Lockheed / Mitsubishi F-104J Starfighter mounted on a pedestal with its nose pointing skywards. The other 3 planes parked next to it comprised of a McDonnell Douglas / Mitsubishi F-4EJ Phantom II fighter, a Lockheed / Kawasaki T-33A Shooting Star trainer and a Beechcraft B-65 Queen Air utility plane. What a sight! The most popular marathon held on Okinawa Island is actually the Naha Marathon which takes place in early December at Naha City. The Okinawa Marathon though less popular is unique in the way the course cuts through the US Air Force's Kadena Air Base (嘉手納基地) between the 29km to the 32km point. I am not certain why the race course is designed like this but I guess it could be the USAF, specifically the 18th Wing of the Fifth Air Force stationed at Kadena Air Base, wanted to engage the local community in some meaningful way and therefore opened the base to the marathon organisers for this once a year event. 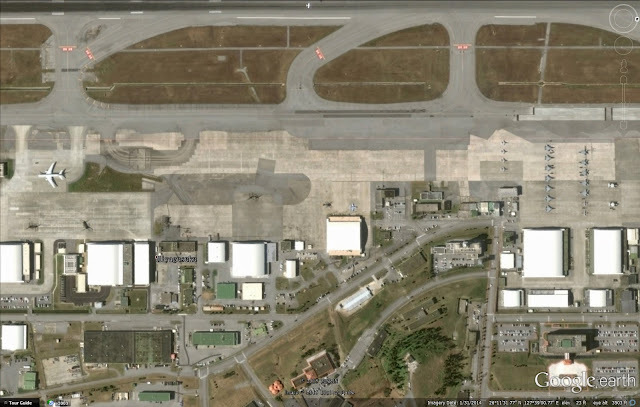 I initially signed up for the marathon because I wanted to see Kadena Air Base up close. 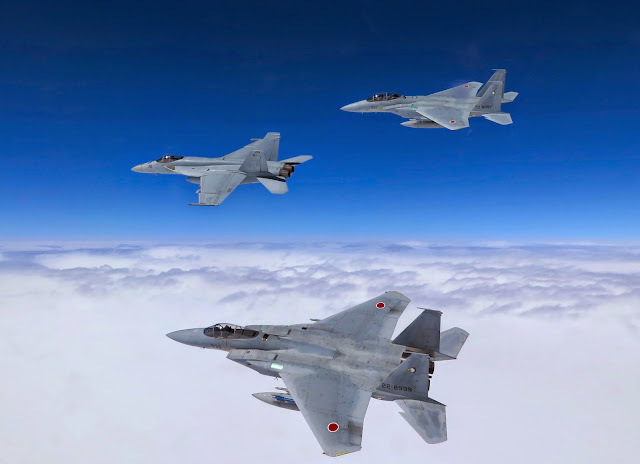 Actually I was secretly dreaming about seeing the Lockheed Martin F-22 Raptor stealth fighters which I know had been deployed to Kadena Air Base but logic tells me the race course would never be anywhere close to the runways or the aircraft. 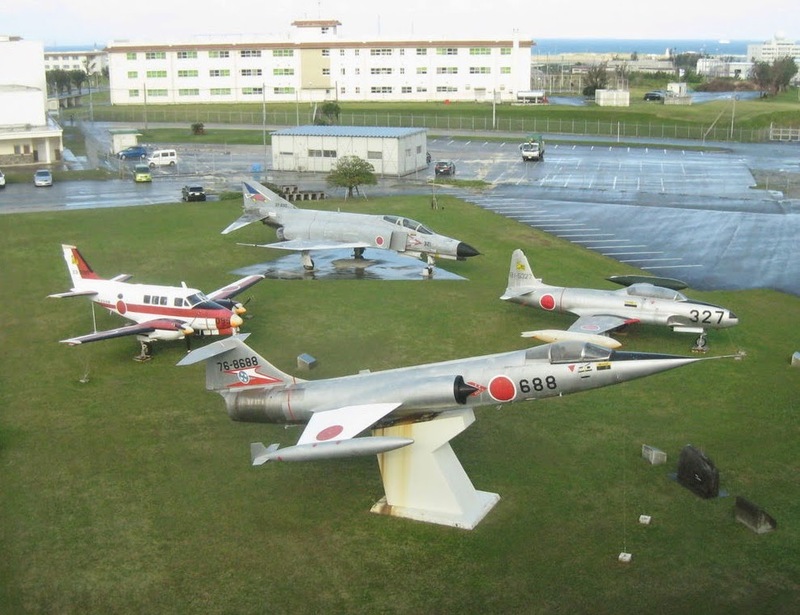 In fact, Kadena Air Base is so huge that runners basically only get to run past living quarters, schools, supermarkets, storage bunkers etc. through the low security zones for the entire 3 kilometers between Gate 2 and Gate 5. I did not at any point in time get even a glimpse of any aircraft or runway! Runners did however get plenty of support and cheering from base personnel and their family members who turned out in large numbers to watch the marathon. Most cheer the runners in fluent Japanese with shouts of "Gambare" " Gambatte" which means "keep at it" or "go for it" and "Faito" which means "Fight!". Many stand by the road side under the hot sun ( hot even in winter! ) to offer runners drinks, sweets, salt and fruits. 23rd 2015 Okinawa Marathon : Entering Kadena Air Base Gate 2. 23rd 2015 Okinawa Marathon : 29km point just after entering Gate 2, Kadena Air Base. Base personnel and their family members turn out in large numbers to cheer the runners on. 23rd 2015 Okinawa Marathon : Possibly high school kids from Kadena Air Base cheering at 31km point. So you see even a civilian event has a decidedly military flavor in Okinawa. After the marathon, it was time for some sightseeing and some R and R. I went back to Naha City and rented a car to explore Okinawa Island. As I followed the main road north towards Okinawa City, I passed Marine Corps Air Station Futenma ( 海兵隊普天間航空基地 ) at Ginowan City some 9km north of Naha. MCAS Futenma is home to about 3000 marines of the 1st Marine Aircraft Wing and has a variety of rotary and fixed wing aircraft operating out of it. It had been constructed by the US military in 1945 after the defeat of the Imperial Japanese Army in Okinawa. Over the next 70 years, Ginowan grew from a small village into a congested city of 93000 in population, and Futenma sits right in the middle, occupying a large tract of prime land which could have been used to construct roads, housing and commercial zones. 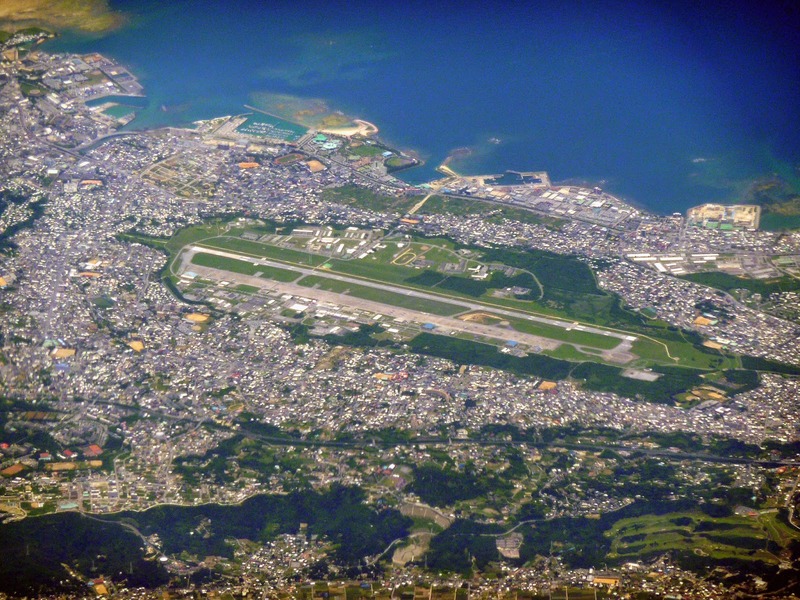 Aerial view of MCAS Futenma and Ginowan City in a photo dated May 2010. Source Wikipedia. Residents living near the air base had to endure noise form aircrafts taking-off and landing. They also had to bear with the smell of fumes and exhausts from aircraft engines. The risk of air crashes is always a worry and roads have to be detoured around the base through narrow coastal corridors making them vulnerable to congestion and jams. Fortunately for me, it was a weekday and the traffic was smooth. I saw several C-130 transport aircraft in the distance and that was about it. 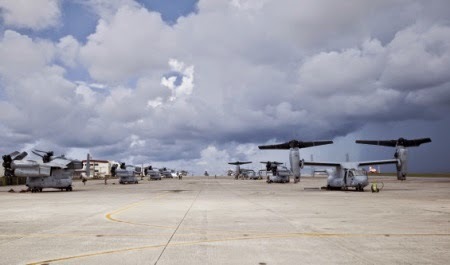 Of all the aircraft deployed at Futenma, the most iconic would be the Boeing MV-22B Osprey tilt-rotor aircraft. 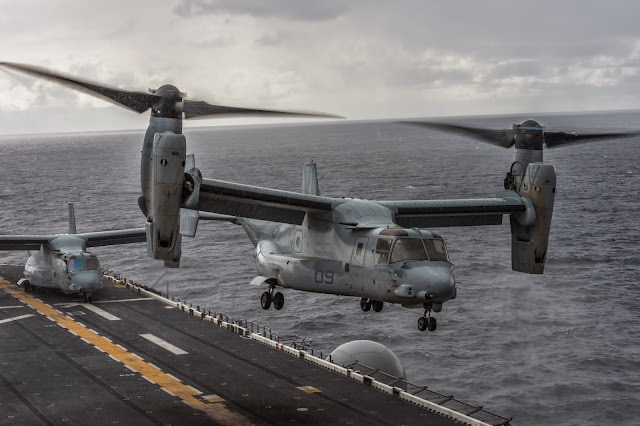 They began arriving in Okinawa from 2012 as a replacement for the Boeing CH-46 Sea knight helicopters which were completely retired from service by 2014. A total of 24 MV-22s in 2 squadrons are now deployed in Okinawa. This hybrid aircraft is also at the centre of numerous protests to get the Marines out of Futenma. It is almost synonymous with the US Marine Forces and I have encountered more than once bumper stickers with the "No Osprey" logo as I explored Okinawa Honto ( main island ). 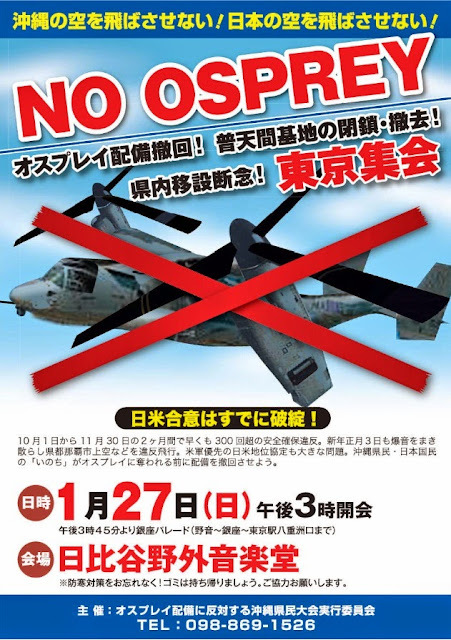 In fact there is a No Osprey Movement in Okinawa that is gathering momentum to get rid of the US presence in Okinawa. Okinawans are no longer satisfied to have some of the Marines relocated to Guam. They do not want Futenma relocated to Henoko (辺野古) at the northern part of Okinawa main island near Camp Schwab ( another US military facility ). They want the US out of Okinawa for good. No オスプレイ ( No Osprey ) 新基地 No!! ( New Military Base No!! ) 美ら海をろう! ( Protect Churaumi which means Beautiful Seas in Okinawan ). 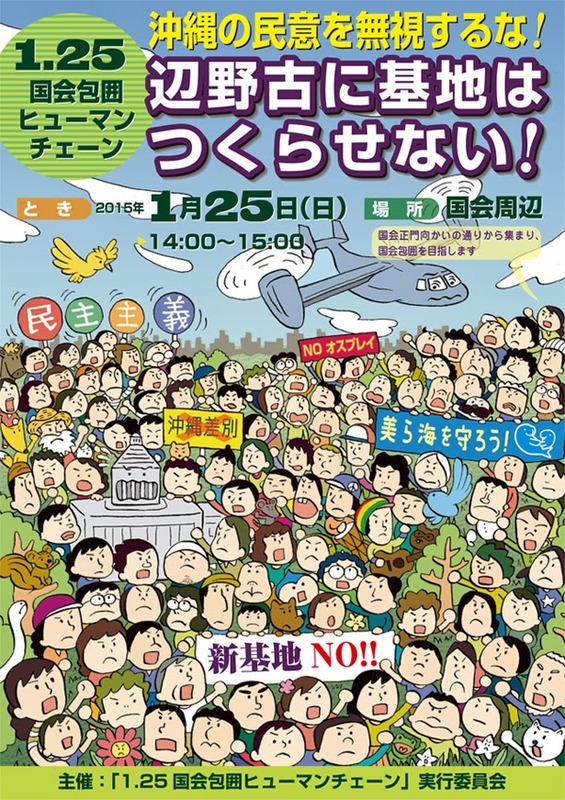 Poster to call for the surrounding of the National Assembly building on 25th Jan 2015 by a human chain to protest against the construction of a new US base at Henoko ( 辺野古 ) in the northern part of Okinawa Island. As I drove past Camp Schwab near Henoko, I witnessed a ragtag group of Okinawans protesting at the gates, some displaying banners, others creating noise and arguing with the police as they attempted to exercise some form of crowd control. I decided to just move on without stopping as it was a potentially explosive situation but it really gave an idea of the popularity of the US forces in Okinawa. The Motobu Hanto ( 本部半島 ) or Motobu Peninsula is located in the northern part of Okinawa Island. It is rather hilly and is most famous for the world class Okinawa Churaumi Aquarium ( 沖縄美ら海水族館 ) who's huge acrylic tank houses several adult whale sharks and many other sea creatures. I happened to be staying at the Hotel Orion Motobu Resort and Spa within a few minute's walk from the aquarium. 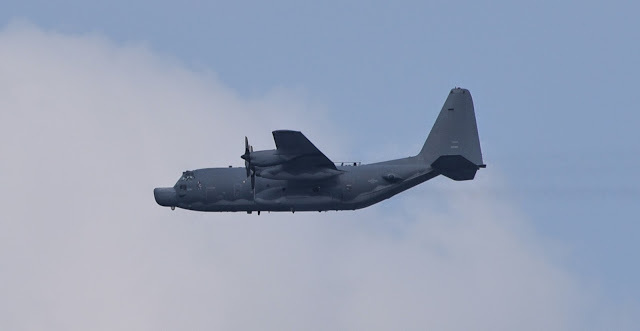 As I was taking pictures of the beautiful beach and surf from the 10th storey balcony of my room, I spotted a C-130 in air force grey flying past and quickly took several shots at the maximum focal length of 300mm with my Nikon D750. Only later when I viewed the images on my lap top did I realized that it was a MC-130 Combat Talon from its unique and distinctive nose. 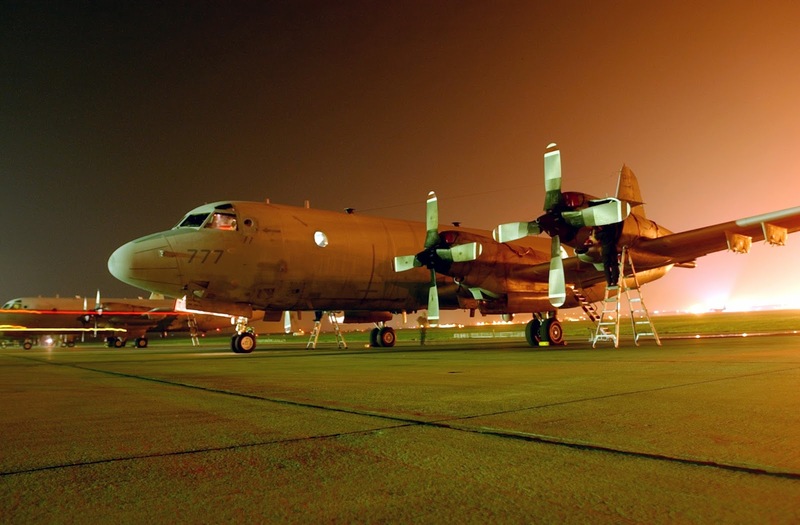 Cropped image of a USAF Lockheed MC-130H Combat Talon II special operations military transport aircraft overflying Motobu, Okinawa Island. 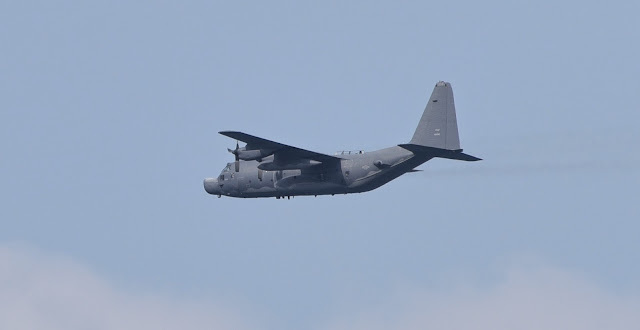 Another photo as the MC-130H receded. Numbers on the tail cannot be resolved for unit identification. 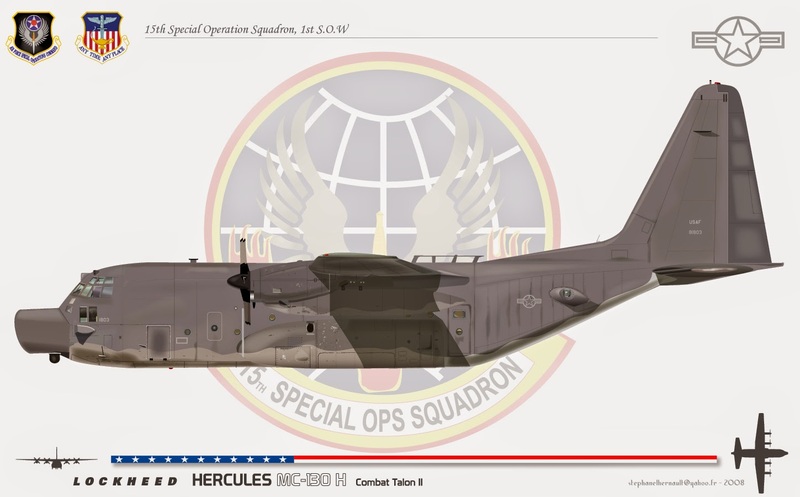 Further checks revealed this aircraft to be most probably the MC-130H Combat Talon II. I have no idea where it was heading ( probably Kadena Air Base since it was heading south ) or what it was doing that morning on 17th Feb 2015 over the resort beaches of Motobu. Either some special forces dude was busy training or some air force puke was having a joy ride. It is not everyday that one gets to encounter a MC-130. Back home I am more likely to see a run of the mill C-130B or H variant. In any case, it seems that having military aircraft of some sort fly over your head is a common occurrence in Okinawa, no matter near or far from an air base. I initially thought they were some local turboprop island hopper but several things stood out to suggest otherwise. Firstly the drape paint scheme is rather unlike the usual colourful decors of civilian airlines, especially those of Japanese airlines, where you can sometime see the entire plane being painted over with cartoon characters, fuselage and tail and all. Then I noticed the aircrafts had four engines each and they were relatively huge in size. Island hoppers are usually small short ranged turboprops with two engines. The sheer number of identical aircrafts aligned in neat rows is also unusual for civilian crafts where you are more likely to see a variety of different aircraft models at any one place. So I took a closer look and realized they were P-3Cs. Wasn't sure if they were Japanese or US at that moment looking head-on but of course now I know better. 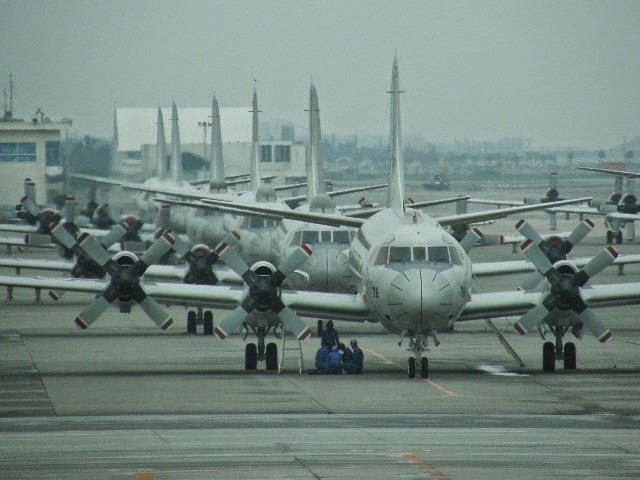 Chinese submarines and surface vessels must have been intruding into Japanese waters regularly in order for Japan to station such a large number of P-3Cs at Okinawa. 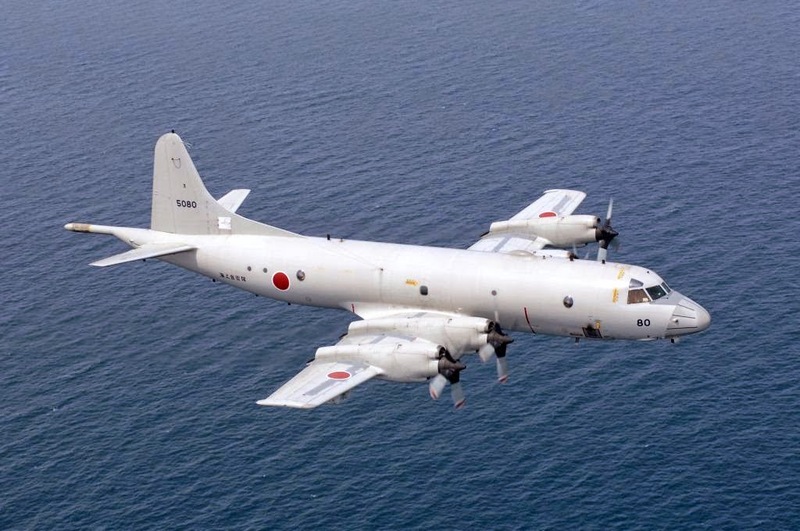 Japan Maritime Self Defense Force Lockheed P-3C Orion MPA over open ocean. JMSDF Photo. From the moment of arrival to the very last moment before departure, there was never a day that went by without me encountering military personnel, hardware, facility or event of some sort in Okinawa. I would say the military has permeated into every aspect of life in Okinawa and brought about plenty of negative impacts to the ordinary citizens of Okinawa. Apart from the security that came with the stationing of US troops, the only positive impact of 70 years of US occupation is that many Okinawans can speak English, well at least conversational English, much more than the Japanese people from the other 46 prefectures, and I almost forgot to mention, this uniquely Okinawan creation of Taco Rice ( タコライス, takoraisu ). 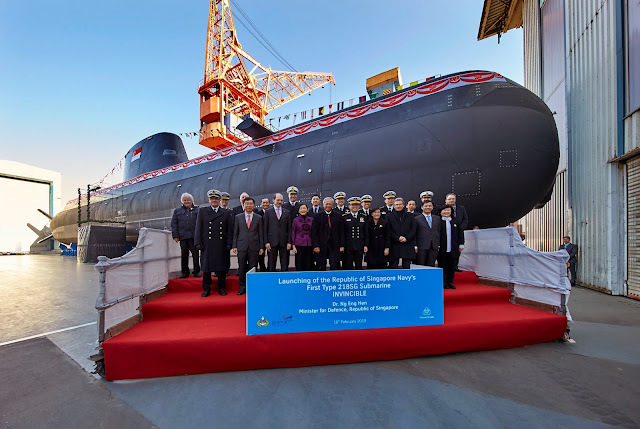 The United States needs to engage Asia have her presence felt in the Western Pacific. Otherwise countries like China, North Korea and Russia would do what they please and most of their intentions are nefarious, to put it mildly. 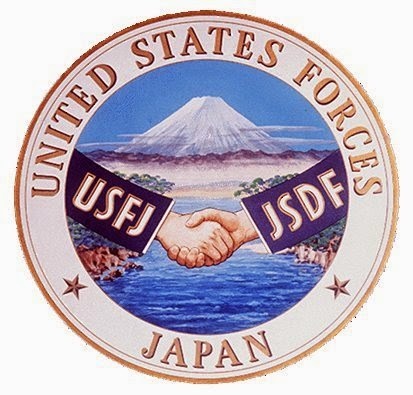 The Treaty of Mutual Cooperation and Security between the United States and Japan signed in 1960 dictates that any attacks on Japanese or US interests perpetrated on Japanese administered territories would have to be acted upon by both countries, and to that extend also provides for the continued presence of US military bases on Japanese soil. Okinawa, nicknamed the Keystone of the Pacific by the Americans, however is host to 62% of all US military bases in Japan, despite making up only 0.6% of Japan's total land area. 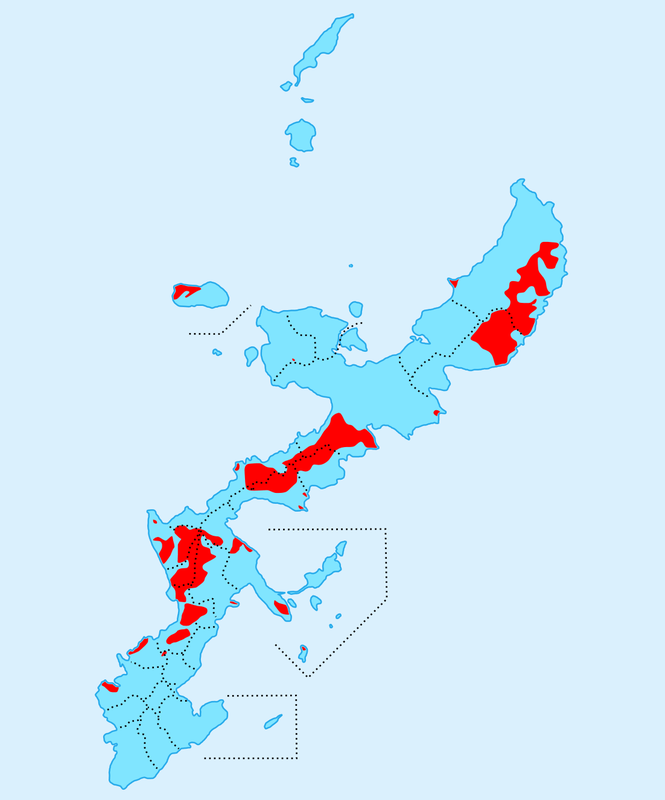 Okinawa, being the poorest, the furthest and the least influential prefecture of Japan thus have to bear a disproportionate burden of accommodating the bulk of United States Forces Japan ( USFJ ) with warts and all while the rest of mainland Japan enjoy the security that the Americans provide. If President Obama has a Pivot to Asia policy, then I assume Okinawa has to be the fulcrum of that pivot. 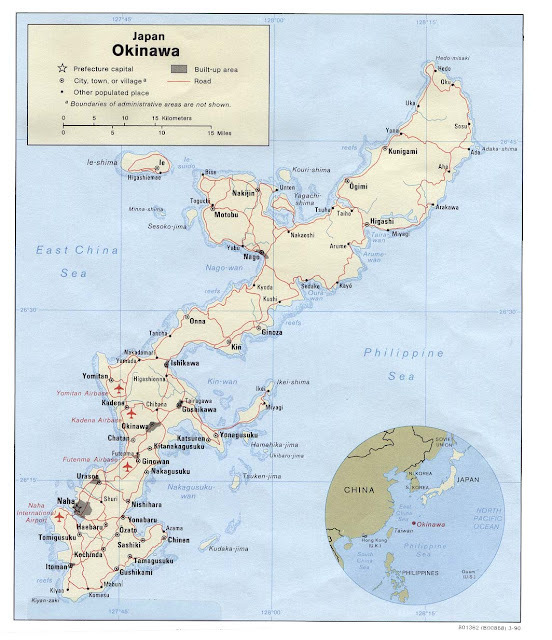 Historically, Okinawa was a very important strategic location for the US Forces in the Western Pacific due to its proximity to East Asia and South East Asia. Today, with the Cold War long over and facing forever shrinking defense budgets and the displeasure of the Okinawans, the US should really reassess the need to have a permanent presence in Okinawa. Advancement in weapons technology over the decades may have partially rendered the continued occupation of Okinawa by US Forces redundant. Why forward deploy when you can achieve the same deterrence by having stand-off weapons? In my opinion, the US could safely withdraw most of her active military personnel currently deployed in Okinawa back to US soil and return most of the base facilities to the Japanese government, only retaining a skeletal crew and fraction of the land for pre-positioning of combat materials. During times of crisis, a rapid reaction force can quickly be dispatched to Okinawa without the need to shift heavy equipment. In that way The US can still uphold her commitment to the defense treaty with Japan. Futenma can be closed and the land redistributed for other uses. Kadena can be transferred to the JASDF of Naha Air Base so that being the most important and busiest air base in Japan, they do not have to share the runway with civilian aircrafts anymore and Naha Airport can be expanded and redeveloped without the constraints of accommodating the JASDF. 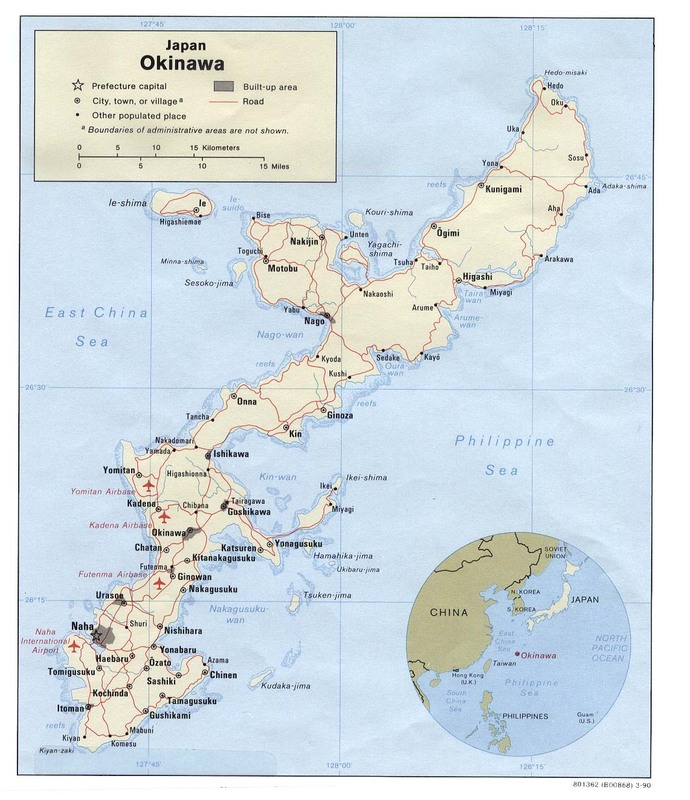 With all that land thus recovered from the US, it might even be possible for Okinawa Island to finally have a rail system to facilitate travel between the various cities and towns. 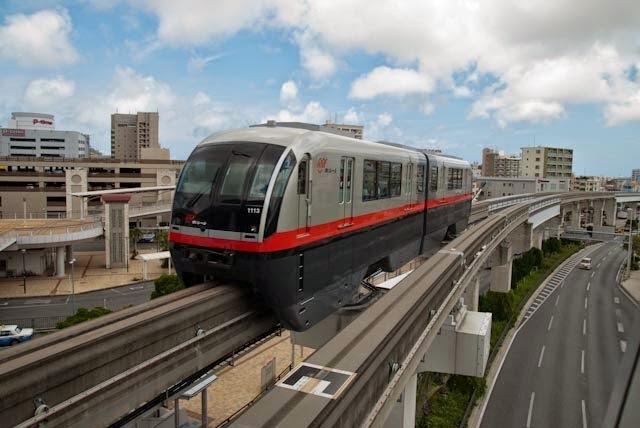 As far as I am aware, Okinawa is the only Japanese prefecture without trains, the closest it can claim is the Yui Monorail which runs from Naha Airport to Shuri Castle, with all of its twelve stations within the confines of Naha City. 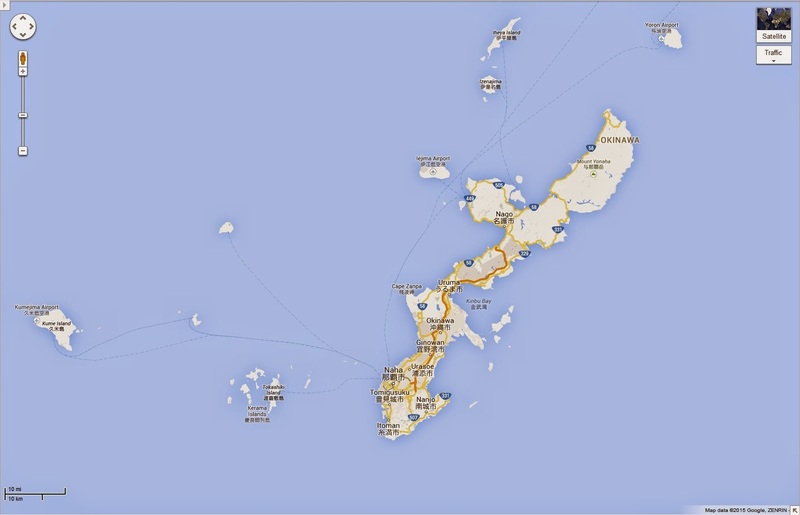 Even Hokkaido, the northernmost prefecture of Japan, will be getting its Shinkansen or bullet train connection next year ( Hakodate, 2016 ), but Okinawa has nothing! The world will be celebrating the 70th anniversary of the end of World War Two this year and US administration of Okinawa had ended 43 years ago. It is time for the US to relinquish the right to occupy Okinawa and put an end to the suffering of the Okinawa people, who did not ask for the War in the first place. Thanks for an excellent description and photos of the history and current military situation in Okinawa. I'm wondering if Okinawa's economy would suffer if the Americans withdrew? I assume many shops rely on the Americans? True that medium range missiles and aircraft from China make bases on Okinawa vulnerable. Some of the bases could move to Darwin, Australia and probably be more welcome. I've put Full Frame on my No.1 "Submarines" blogroll. See http://gentleseas.blogspot.com.au/2015/03/japans-legislative-process-for-sale-of.html and many other Japan-Australia posts. Okinawa's economy would not suffer much if the US withdrew as tourism is now the number one source of revenue. In 1972 Base Related Revenue ( Annual Land Lease Fees, government subsidies, wages paid to Okinawan base employees, retail consumption by Americans etc ) formed 15.5% of the Gross Prefectural Product. By 2009, the BRR is only 5.2% of the GPP, probably even lower today as tourism continues to boom. The bulk of the tourists used to be domestic Japanese but increasingly the Chinese ( mainland, Taiwan and Hong Kong ) tourists are taking over and they are the big spenders. My week long stay in Okinawa coincided with the 2 week long Chinese New Year, and almost ALL the hotels in Naha were fully booked till end Febuary due to this Chinese influx, undoubtedly fueled by the greatly depreciated Japanese Yen. They also swarmed Japan and I later read that there had been a 200% increase in overseas travel during the New Year for the Chinese people compared with the year before. As for relocating to Darwin, I have had reservations. Hosting American facilities will inevitable bring social problems like increase in crime rates and prostitution. There may be environmental impacts as well, like the chemical leak ( blistering agent Lewisite, defoliant Agent Orange ) at Chibana Ammunitions Depot in 1969 leading to the evacuation of residents for months and the subsequent dumping of these chemical in the seas off Okinawa. You may not want the GIs on Australian soil even if they promised to help get rid of the Cane Toads. Be like Singapore. Host the Littoral Combat Ships at the naval base, but make the seamen bunk onboard ship during their 8 month long forward deployment!